Note 7 has released recently which offers a brand new S Pen .This S Pen is the signature feature (we couldn't resist) of the Note series and it's better than ever on the Galaxy Note7. Samsung wants to make sure we know it and has published some details on the stylus that's not really a stylus. For starters, the Note7's S Pen is water resistant with an IP68 certification to match the phone itself. And we don't mean it just won't die - it actually works under water. 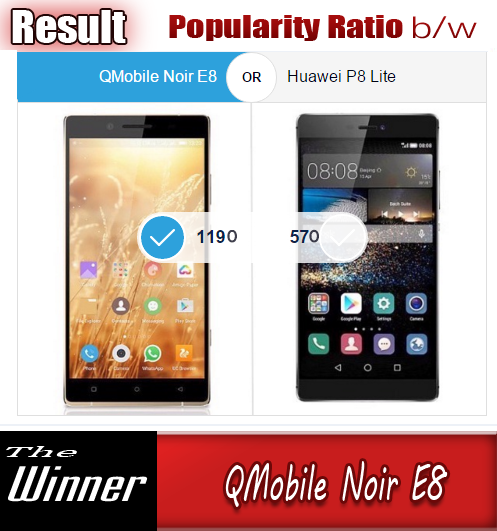 It's electromagnetic resonance (EMR) technology that does the trick, and the digitizer in the phone can communicate with the internal coil in the S Pen to identify its position and degree of pressure - an interaction unhindered by water. We wonder how that more complex setup will affect potential tip replacements, though. Anyway, the S Pen has been physically redesigned, and even though you may not notice it's gotten 2.6mm shorter than the one in the Note5, you can't miss the much thinner 0.7mm tip (vs. the old 1.6mm). 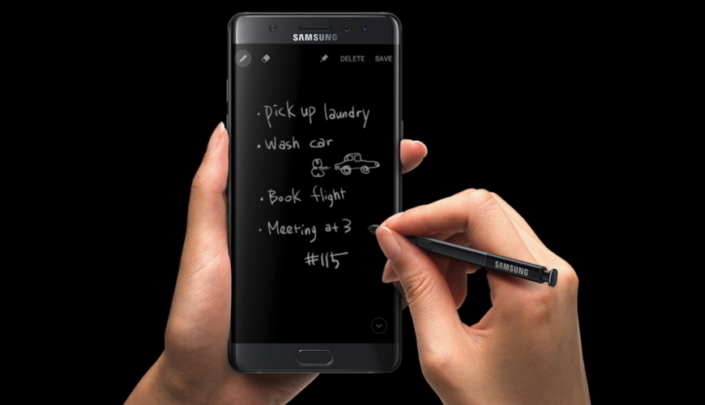 Samsung states that allows for 'finer penmanship' and better emulation of that ink on paper feeling. Strides have been made on the software side of things as well. Screen off memo now works on the Always On Display, you can create GIFs from videos (crops of the frame, too), and you can use the Magnify feature to check tiny details when sites refuse to let you zoom in. And let's not forget Translate, which can recognize 38 languages on its own and then, well, translate into 71 languages. The S Pen is an unmistakable trademark of the Galaxy Note series, providing a unique experience that extends beyond traditional writing and navigational capabilities. With the Galaxy Note7, Samsung made enhancements to the S Pen, providing unsurpassed convenience so users can do even more on their smartphone, faster than ever before. 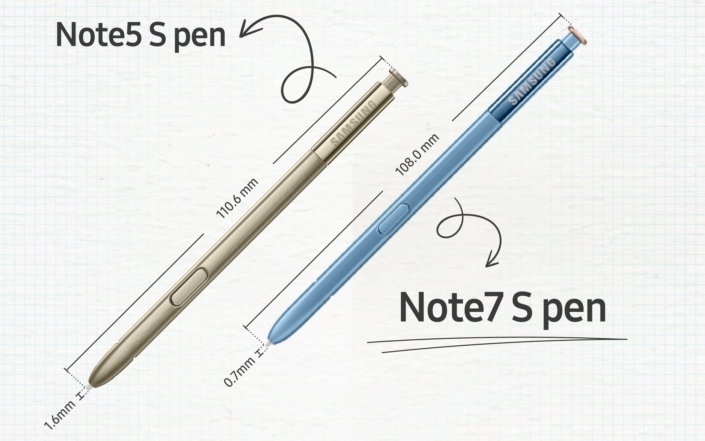 The most noteworthy enhancement of the new S Pen is that it replicates the ease and accuracy of a real pen. The optimized pen tip—which is possibly the most important component of a writing utensil—is made from an elastomer material that allows it to glide smoothly over the smartphone screen. It is also about 60 percent smaller than its predecessor, measuring 0.7 millimeters in diameter. The pen tip is comparable in size to that of a traditional writing tool, allowing for finer penmanship, and it is sharper to make the writing experience more natural and enable more detailed illustrations. Together, these components work to emulate the feeling of ink on paper—a comfortable transition from analog to digital. 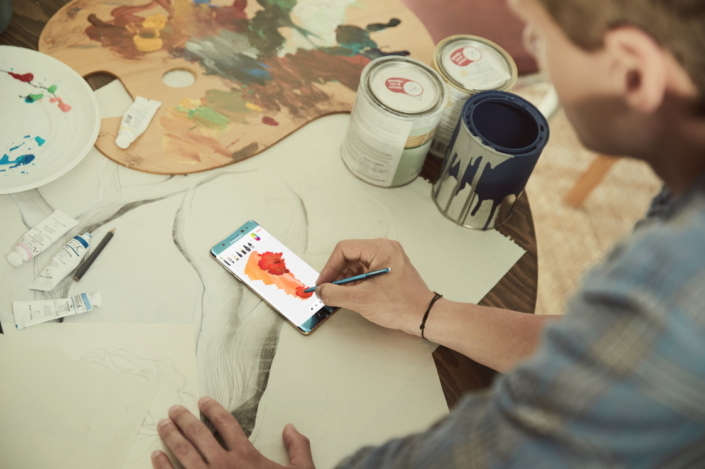 The button on the S Pen has been moved to a new location to eliminate the possibility of unintentionally pressing it, making the writing and drawing process even more comfortable. Unlike other devices on the market, the Galaxy Note S Pen is battery-free and does not need to be charged. Furthermore, it is stored in the phone itself, making it easily accessible anytime, anywhere. The Galaxy Note7, including the S Pen, is water and dust resistant with IP68 certification. * Making the S Pen water resistant was made possible because of the electromagnetic resonance (EMR) technology. The S Pen’s internal coil and the phone’s digitizer recognize each other’s electromagnetic fields, and utilize signals to identify the pen’s location and pressure to enable writing and drawing functions. Unlike a stylus or the human finger, which both use static electricity to work, the functionality of EMR technology is unaffected by water. To make the S Pen water resistant, Samsung engineers had to ensure the protection of every component. They did so by integrating multiple technologies, including printed circuit board (PCB) molding and rubber sealing. The molding in particular covers the surface of the PCB and consists of a special epoxy material. This material is ultra-thin but is durable enough to ensure complete water resistance. The molding shape was also carefully crafted, taking into consideration the S Pen switch. Rubber sealing, on the other hand, prevents water damage by sealing off all vulnerable passageways, and by covering important components. This sealing process provides the ultimate protection from water without affecting the S Pen’s functions or components. Take the S Pen’s pen tip, for example. This structure reaches to the internal components of the pen and makes tiny movements that trigger the pen pressure switch. In addition to preventing water from flowing in, the sealing process also ensures that there is enough room for the pen tip to move as needed. Inspiration can strike anytime – even if your phone is off. That’s why Samsung designed the Galaxy Note7 so the S Pen can be used even when the screen is off. With the new Screen off memo on Always On Display feature, users can simply pin a memo to the Always On Display for a quick reminder about important events and tasks. In the same way they might jot down a memo on a sticky note, users can scribble short messages directly on the display. Memos remain displayed on the screen for an hour, and are automatically stored in the Samsung Notes app. They can be checked at a later time by double tapping the memo icon. Because the S Pen handles multiple functionalities, note-taking functions were previously divided into several apps such as Action Memo, S Note, Scrapbook and Memo. With the Galaxy Note7, Samsung integrated all of these functions into a single consolidated application called Samsung Notes. With Samsung Notes, users can create, edit and manage all S Pen creations as well as other types of memos from one convenient location. They can also import existing content from S Note and Memo and continue using it on the app. Another convenient addition to the Galaxy Note7 is its optimized text input options. With support for check boxes, numbering and font colors, organizing to-do and shopping lists is a breeze. In addition to text, the phone offers a wider array of drawing tools. The Galaxy Note7 boasts six types of specialized drawing tools that let users better express themselves and bring their creative ideas to life. The oil paintbrush allows users to mix multiple colors and the watercolor paintbrush enables color layering. Additionally, with the calligraphy brush, by applying different pressure levels, users can change the thickness of the strokes. The S Pen uses an electromagnetic field so the display is able to recognize the S Pen even when it is not in direct contact with the device. In fact, it can be detected by the smartphone from a distance of up to 14 millimeters. Accordingly, Samsung has improved hovering capabilities that enable certain functions when the S Pen is within this specified distance from the display. These new features add even more fun and convenience to the smartphone experience. It’s now easier to create, save and share not only images, but also animated GIFs, which can be captured from videos with Smart Select. Translate** is another example. Without opening a dictionary, users can effortlessly look up the meaning of a word by simply hovering over it with the S Pen. This includes words formatted as images, which are recognized by Optical Character Recognition (OCR) technology. Translate can identify 38 languages and translate recognized words into 71 languages. The new Magnify feature can be used to enlarge small text from news articles, documents and even images on websites that do not permit zooming. Whether painting, scribbling or jotting down ideas, the smoother, faster, more intelligent Galaxy Note7 S Pen lets users push the limits of what they can do on their smartphone—whether it’s for work or for play.